Last week’s post  introduced you to a former Secretary of Defence, Bill Pritchett, and some aspects of his career. Today, watch Pritchett do one of the most difficult things any public servant can attempt—argue with a Prime Minister’s wishes and attempt to turn policy. The issue is one of the great Australian foreign policy traumas of the last quarter of the 20th century—East Timor—and we follow Pritchett’s pen in the battle with his Prime Minister, Gough Whitlam. Pritchett lost, but he was right. In 1974 and 75, Australian intelligence and the superb work of the Australian embassy in Jakarta meant Canberra knew of every step in Indonesia’s thinking as it moved towards invading East Timor. Australia’s secret knowledge was so deep that Jakarta saw Canberra as complicit and was outraged when Australia later criticised the invasion. Gough Whitlam favoured integration of East Timor into Indonesia, along with what he called ‘obeisance’ to self-determination. Jakarta took the first half of that formula—integration—and didn’t worry too much about the language of the second half. Australia’s Foreign Minister, Don Willesee, was ‘to grow more uneasy with the established policy of non-involvement, to which, publicly at least, Australia adhered with utmost determination’. Willessee never really confronted Whitlam’s commitment to integration; the divisions in Canberra meant Canberra sat still and watched a gathering disaster of which it had extraordinary fore-knowledge. This description and the quotes that follow are drawn from the official document series published by Foreign Affairs, ‘Australia and the Indonesian Incorporation of Portugese Timor: 1974-1976 ’. 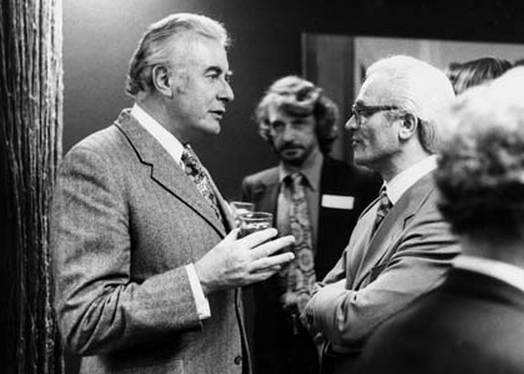 In the policy battle, Whitlam pushed for integration. Foreign worried, ultimately, about Indonesia rather than East Timor, and Defence married strategic need with a dash of international liberalism to advocate Australia’s interest in an independent East Timor. Pritchett marshalled Defence’s thinking in a paper in August 1974 , on ‘the Defence Significance of Portuguese Timor’. Indonesia should be informed at the outset of any consultations on the matter that [t]he strategic significance of Portuguese Timor to Australia gives Australia a deep interest in the future status of the Territory; and without prejudice to our concern to see Indonesian strategic interests satisfied as well as our own, we would, for our own part, favour the emergence of the territory through self determination, as an independent state. Pritchett walked deeper into this battle in February, 1975. As First Assistant Secretary of the Defence Planning Division, he wrote a ‘letter’ , classified Secret, to his equivalent number in Foreign Affairs, as Defence tried try to turn the terms of the argument Whitlam should put to Suharto about the gathering storm. Pritchett’s line was that Australia had to go harder—and presumably go public—in its engagement with Indonesia, East Timor and Portugal. Over here [Defence] we feel that to represent our concern to the Indonesians, to urge them to change their tack, accept the concept of an independent Timorese state and work for influence on it, and to offer to support this approach by some economic aid, while all important points for our policy, may not make sufficient impact on the Indonesians. We feel that they are likely to need some more substantial encouragement. This Treaty, which would be without time limit, could refer to common interests, amity, co-operation and so on, but would contain a key article whereby the parties would agree to consult together about developments affecting their common interests in the security and stability of the region. Pritchett said that Timorese independence without Indonesian support would be illusory. Working together, Australia, Portugal and Indonesia could persuade East Timor to accept an arrangement that satisfied its independence aspiration while reassuring Jakarta. The chance would be lost, he wrote, if the Indonesians were ‘too greedy and impatient or the Timorese too ambitious or given to haggle’. And, as he didn’t bother to write, the moment would also be lost if Australia havered and wavered. That’s precisely what Australia did do, and nearly 40 years later we’re still working towards Pritchett’s Treaty structure: a security consensus between Australia, Indonesia and Timor Leste that will serve and preserve the interests of all three. Take two simple yet also diabolically complicated lessons from this case. The duty of a public servant is to think and do—and even argue with a Prime Minister in pursuit of the best policy. Secondly, put the argument on paper, making it harder for politicians and fellow public servants to ignore. The writing matters not just for the policy it argues, but for the history it preserves. And history has judged that in his thinking about East Timor, Bill Pritchett’s judgement was on the right side of history. Graeme Dobell is the ASPI journalism fellow. Image courtesy of National Archives of Australia .